Broccoli rabe, sometimes called rapini, has a pungent, bitter flavor and is much used in Italian and Chinese cooking. 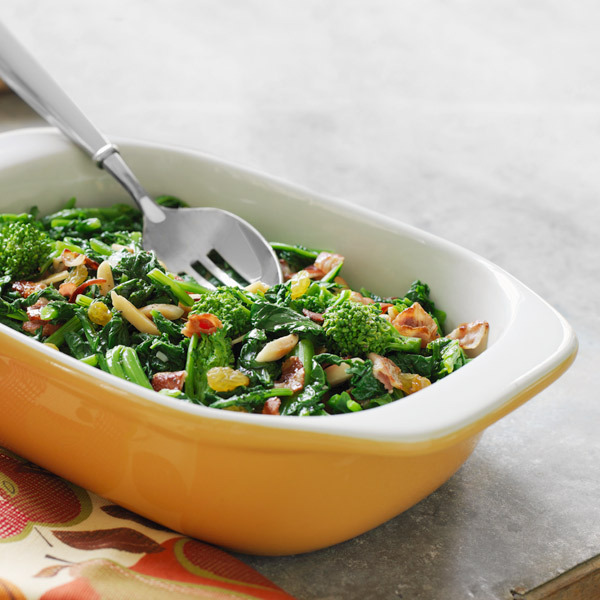 In this easy recipe, broccoli rabe, pancetta, garlic, golden raisins and toasted almonds are sautéed in olive oil to create a bright and flavorful side dish. In large pot of boiling water, cook broccoli rabe until bright green and tender, about 6 minutes. Drain and rinse under cold water to stop cooking. In large skillet, heat oil over medium heat. Add pancetta and cook until crisp, about 4 minutes. With slotted spoon, transfer pancetta to paper towels to drain. Reserve oil in skillet. Add garlic to skillet and cook over medium-low heat until golden, about 3 minutes. Add broccoli rabe, pancetta, raisins, toasted almonds, salt, pepper and nutmeg. Cook, tossing frequently, until broccoli rabe is very tender, about 5 minutes.